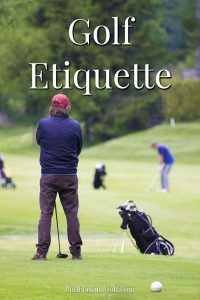 This guide to golf etiquette for beginners serves as a basic introduction to the finer points of the game. Golf is probably the most sporting game of all. After all, there are not many sports where players are expected to, and do call their own penalties on themselves. It’s this tradition that has earned golf its reputation as the game of gentlemen. But not all new players are necessarily aware of all the intricacies of the game, or what’s expected of them on the course. There are certain standards you must adhere to before you even take that first tee shot. Firstly, most golf courses have dress codes that dictate how you dress for your round. For example, on most courses you won’t be allowed to wear running shorts, tracksuits, or t-shirts. Your shoes are another important part of your golfing outfit. You may not yet have dedicated golfing shoes with spikes. If not, make sure you don’t wear any footwear with deep, rough treads that may cut up the putting greens. When you have a tee time for your round make sure you’re there in plenty of time. You should finish any warm up or practice shots early enough to leave yourself plenty of time to get to the first tee. When you’re playing in a group you can tee off in any order you choose on the first tee. After that, the convention is that on each subsequent hole the players in the group hit their tee shots in the order of the lowest scores on the previous hole. So the player who scored the least on the last hole tees off first on the next hole, followed by the player who got the second lowest score and so on. If two players scored the same on the previous hole, these players tee off in the order they did previously. After the tee shots, the group should proceed down the fairway preparing for their next shots. The player who is furthest from the hole plays their second shot first, then the next furthest away and so on. The rest of the group shouldn’t continue on to their balls until the first player has played their next shot. Instead they should remain behind the player until after they’ve played their shot. In this way, they don’t distract the player and they’re not in the line of fire, so to speak. This convention should be followed until all players are on the green. At this point, it is again the player who’s furthest from the hole who is first to putt. You should avoid playing to slowly as this causes the group behind you to have to wait which has a knock-on effect for the following groups causing them all to back up. Walk at a brisk pace between shots, and don’t take long over each shot. Start planning your shot as you walk to your ball. It’s important that you look after the golf course as you make your way around it. So you should replace your divots as best you can. This isn’t always easy, but put the turf back in place and press it down with the heel of your shoe, especially round the edges. After playing bunker shots, rake the sand smooth using the provided rakes. This includes both where your club struck the sand and your footprints from walking in the bunker. When entering a bunker you should always do so from below the ball and as close to the ball as possible. Avoid standing on the steep face of bunkers. After raking, leave the rake in the bunker or somewhere close to it. On the green, repair any pitch mark your ball made when it landed. Use a tee or a specialist repair tool to flatten the edges of the pitch mark and then firm it down with your putter. The putting line is the imaginary line between a ball and the hole. It’s considered very bad golf etiquette to walk on the putting line of an opponent so make sure you don’t do this. If your ball has ended up in the way of another player’s, you should offer to move it while they take their putt. Mark the position of your ball by placing a marker or small coin behind it, then lift up your ball. Then place your putter so the heel is touching the marker and the club is pointing at a 90 degree angle from the marker. Next, move your marker from the heel to the toe of your putter. Once the other player has putted, reverse this process to replace your ball in the correct position. When anothe player is putting, make sure you keep still and don’t stand anywhere in their sight line where you may distract them. Also, don’t make any noise that may put them off. Once everyone has finished the hole, move to the next tee straight away. Don’t keep other players behind you waiting by standing on the green and filling in your scorecards. Golf is a sport with its own unique codes and conventions. Follwing the advice in this guide to golf etiquette will help prevent you doing something wrong and annoying other golfers.